FEMA’s restrictive land-use policies are showing up in Oklahoma City, impacting land owners trying to rebuild after May’s devastating tornadoes. OKLAHOMA CITY- Some tornado victims, who lost their homes, fear that they may not be able to re-build. Rhonda Northcutt said she is unable to get a building permit from the city because of where her home was located before it was destroyed. “It is just unimaginable that I have to go to bed at night thinking that I even have to deal with this,” Northcutt said. Northcutt and her neighbor Jennifer Wisooker live in a neighborhood near May and SW 149th street. Their homes were destroyed by the May 20th tornado. According to the city, there are homes in the neighborhood that are located in an area designated as a flood way. The city said it is unable to give permits to build new homes in these types of areas because of FEMA requirements. Even though their homes were there before the storm, Wisooker and Northcutt might not be able to re-build. “For 29 years that’s been my home and that sense of home I’ll never have again; that sense of familiarity it is just gone,” Wisooker said. Both women said they own their property and have received insurance money to re-build. The city has contacted FEMA about the problem. A city official told NewsChannel 4 the city is trying to work with the families and help them as much as possible. “I don’t need them to decide whether I’ll be safe or not on my own land,” Wisooker added. The people of Oklahoma have made it abundantly clear – they do not want “Obama Care” in this state. OK-SAFE, Inc. is a 501c4, non-profit Oklahoma Corporation, founded in late 2006 by 13 Oklahomans. We are dedicated to the principles of constitutionally limited government, and the promotion of the American free enterprise system. We act only to secure Life, Liberty and Property (Pursuit of Happiness) in the state of Oklahoma, recognizing that these rights are endowments from God, not privileges dispensed by man. In line with this purpose, OK-SAFE has made opposition to the Affordable Care Act (aka “Obama Care”) a primary focus of its efforts for the last couple of years. 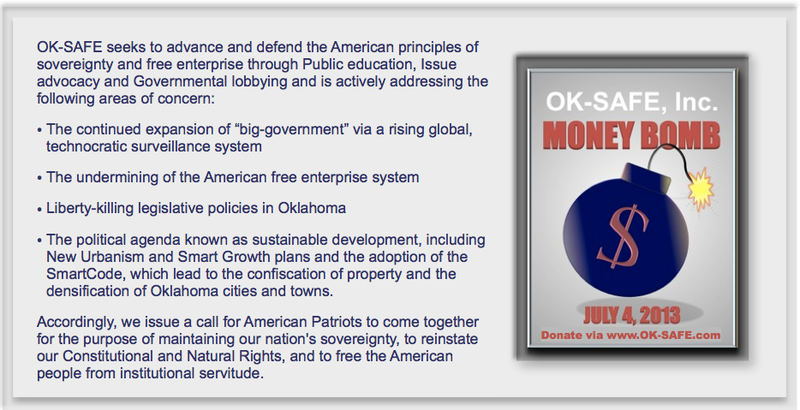 OK-SAFE is a non-partisan policy organization dedicated to Principle over Politics. We are not affiliated with any national organization and conduct original research. The result is that OK-SAFE is able to direct its’ attention where the research and evidence demands – and not where any out-of-state entity dictates. This intentional independence allows us to remain nimble and effective as an organization. OK-SAFE actually reads the bills, unlike many of our elected officials! We read the entire Affordable Care Act; we read and exposed the $54 M Early Innovator Grant for what it was – the means of implementing “Obama Care” in this state. Not only did we lead the fight against this federal intrusion, weled Oklahoma’s successful push back against Insurance Exchanges, not once, but three times. OK-SAFE conducts its’ our own research and source all of its’ work. In fact, OK-SAFE was the only grassroots group invited to give testimony to the 2011 Joint Legislative Committee on Federal Health Care Law in Oklahoma. This same presentation, entitled Health Care Reform – IT, Security and Privacy Concerns has been read online over 3,500 times by people from across the country. This research also laid the foundation for the creation of our single-subject website Exposing Health Care Reform, now used by researchers from across the nation. Help OK-SAFE continue its’ work. Make plans today to donate to the July 4th MONEY BOMB. OK-SAFE Executive Director, Amanda Teegarden, has been and continues to be a frequent featured guest speaker at both in-state and out-of-state events, and has even been featured in a full-length documentary film entitled Behold a Pale Horse – America’s Last Chance. Our organization has been featured at several national conferences, including three Freedom 21 Conferences. Recognizing the importance of a well-informed electorate, we have developed (and copyrighted) an in-depth grassroots-training program entitled Citizen Involvement in the Legislative Process. These training programs, conducted several times a year, serve to educate everyday citizens about the legislative process, and have improved the effectiveness of other grassroots organizations in this state. Attendees come away with a working knowledge of how the legislative process works, better able to distinguish good policy from bad, and with an understanding of how to decipher political double-speak. OK-SAFE needs your help in fighting “Obama Care” in this state. Additionally, we need your support in order to address other critical issues. Over the last 8 years, OK-SAFE has researched and helped expose such issues as the Trans-Texas Corridor; the REAL ID Act and the collection of biometrics; subversive data collection and surveillance systems; and the political agenda known as Sustainable Development. We plan to continue and expand our work exposing those policies that undermine the rights of the individual; that hinder our ability to enjoy our inherent rights to life, liberty and property; and that interfere in the traditional free enterprise system. We will be taking our internet radio show, America in the Balance, live, enabling us to reach a wider audience with the truth. Seeing the value in last year’s successful Research Summit, we plan to make this an annual event, inviting the best and brightest in the research field to attend – credible researchers willing to share and network with each other to help get the facts out there so real decisions can be made. This “sharing of intelligence” serves us all, especially when addressing the key issues facing our country and state today. We plan to do more outreach and training classes to help increase the effectiveness of Oklahoma’s grassroots groups. All of this takes financial resources to make happen. In November of 2010 SQ 756 passed overwhelmingly. This constitutional amendment was referred to as the Oklahoma Health Care Freedom Amendment, and added a new section of law to the State Constitution – Section 37 to Article 2. It defined “health care system.” This section prohibits making a person participate in a health care system. Thomas Jefferson said, “If a nation expects to be ignorant and free, in a state of civilization, it expects what never was and never will be.” The infusion of knowledge and an enlightened citizenry are essential elements required to maintain liberty. OK-SAFE, Inc. – Note to Oklahoma’s Republican leadership: Common Core is about as welcome in the state of Oklahoma as Obama Care – the people don’t want either one. “…It is in this vein that I present to you a word-for-word, blow-by-blow of State Superintendent Janet Barresi’s visit with the Wagner County GOP June 2013. This was written by a woman named Karen Cuellar – an Oklahoma home schooling mom. I refuse to edit or manipulate in any way her original email. She hit this out of the ballpark – she needs no assistance. Please, read, pass on and become involved TODAY! “I went to the Wagoner County GOP monthly meeting on Thursday night to see what Barresi could possibly say to defend or sell Common Core to the public. Luckily, this was a group of very informed, anti-common core voters who had done their research. She spent a good 30 minutes on “fake fluff” – really avoiding the details of Common Core and speaking in generalities on how great it was. I could tell the audience wasn’t falling for the usual politician talk. We were asked to write questions down and submit them to be answered to keep the crowd under control since this is a very controversial topic. I think it caught her by surprise. She seemed uncomfortable, fumbling for an answer, and replied that the party platforms had language about “government intrusion” but not specifically Common Core. I held up a copy of both platforms and called her out on it. The RNC has 2 full pages that specifically name and deal with all of the aspects of Common Core, and our state platform has one paragraph, but also specifically names Common Core. I had copies of both. She seemed irritated by that, and then continued down a path that had absolutely nothing to do with the party platform or the direct question I asked. I could tell the crowd noticed it, and was just as upset as I was that she didn’t answer the question. Read the rest of this account by one well-informed mom here. 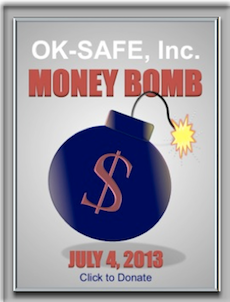 Save the Date — Moneybomb for OK-SAFE set for July 4th! We are celebrating our past accomplishments while looking ahead to expand our efforts. We aim to keep all Oklahomans informed, engaged and free. We need your help! 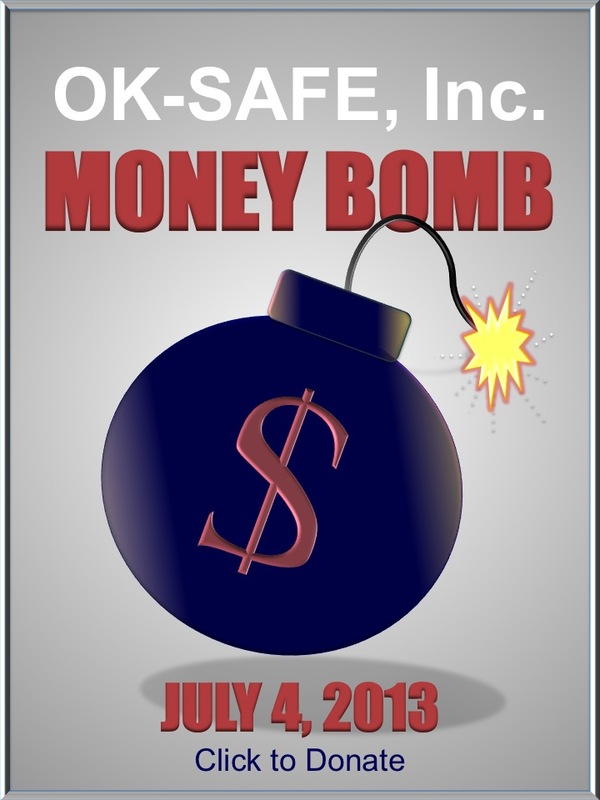 Plan now to make our July 4th Moneybomb a huge success! Share this flyer with a friend via facebook, twitter or email.